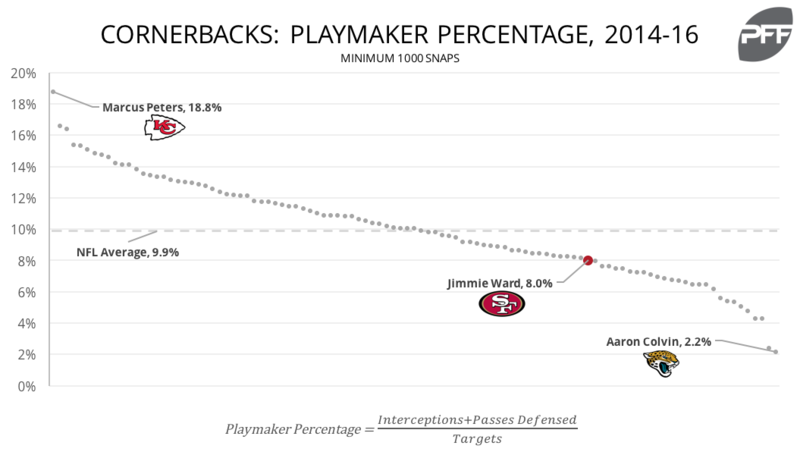 With former first-round pick Jimmie Ward entering his fourth NFL season, the 49ers will soon need to determine whether the team will pick up Ward’s fifth-year option. Ward, who played safety in college while at Northern Illinois, is looking at a possible transition to the single-high safety role in San Francisco’s new defensive scheme. He has primarily aligned as the 49ers’ slot cornerback during his first three seasons. After a rocky rookie campaign in which injuries limited him to just 270 snaps, Ward has been solid for the 49ers, posting 78.3 and 75.8 overall grades in 2015 and 2016, respectively. Despite solid grades, Ward’s impact hasn’t been quite what you’d hope for a first-round pick largely due to his struggles making plays on the ball in coverage. Ward has recorded an interception or pass breakup on 8.0 percent of his targets since entering the league in 2014, ranking 78th among 105 cornerbacks with at least 1,000 snaps and below the league average of 9.9 percent during that span.